As the term insurance is a plain insurance policy without any embellishments, it is very important to know to judge one policy over the other. There are around 24 Life Insurance Companies in India. All of these companies offer the term insurance product. How to choose the Best Term Insurance Plan for you? Last month I wrote a post on why should you buy term insurance plan, which will help you understand fundamentals of the term insurance plan & how it is better for you than other insurance plans. In this post, I will explain the factors which should be considered while selecting the best term plan for you. Now let’s see each factor in detail. As we all know, insurance is a life protection tool. In the case of unfortunate demise of the policy holder, the family members/ nominee approach the insurance company to claim the sum assured. As an expectation, the insurance company, after completing the pre-requisites, should hand over the claim to the family of the deceased. But it does not happen always. Insurance regulator IRDA’s annual reports for 2014-15 reveal that of the total 24 private life insurers, only six have a claim settlement ratio of over 90% (regarding number of policies). The figure tells you that many insurers are tightfisted when it comes to giving benefits to the nominees. The claim settlements ratio of an insurance company indicates the percentage of claims that have been approved out of total claims that are unsettled. Claim settlement ratio has been chosen to rate the insurance companies because it is one of the very important factors while they select the policy. High claim settlement ratio shows the insurer is reliable and could be trusted for taking term plans whereas the low ratio indicates that the credibility of the insurer is less and therefore they won’t attract many customers because of their inability to settle claims. 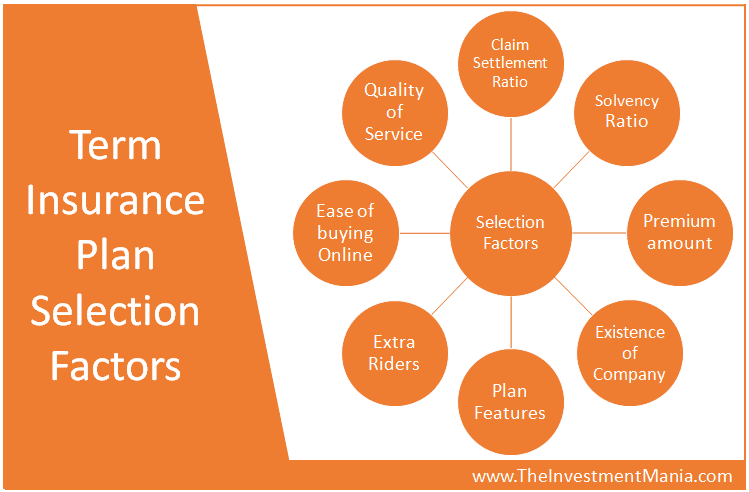 Looking at the Claim settlement ratios of various companies it is clear that Life Insurance Corporation (LIC), ICICI Prudential, HDFC Life, SBI Life and Kotak have fared well in terms of settling their claims and hence stand a good chance of gaining customers’ attention for a Term Insurance Plan. It is a suggestion to all the customers that they make their choices wisely depending on the past performance of the insurers evaluated through their Claim Settlement ratios. Besides that age, health and income of the individual are of ample importance because depending on that only would the insurer decide on the sum insured, premium, term, etc. Rest, the provided list is good enough to choose the best term insurance plan. Below is the claim settlement ratio of all life insurance companies for the year 2014-15. You notice from the above data that the companies which have more than 90% claim settlement ratio are around 6. We can consider that these companies are good while giving back to the insurer. So you can shortlist few of these from the list. However, from here onward, Claim Settlement Ratio may not be the most important and sole criteria in choosing your term insurance. The reason is, recently IRDA amended the Section 45 of insurance act. According to this section, if the policy continued for 3 years or more, then the insurance companies cannot reject the claim. So claim settlement ratio is not a big priority now for the selection of insurance. However, it will give you an indication of how the company is aggressive about settling claims. However, you may feel some comfort and a tool to judge the insurance company. But remember that this is not the sole criterion to judge the insurance company. Different countries use different methodologies to calculate SR, & have different requirements. E.g. 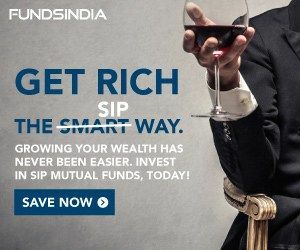 in India, IRDA has set a limit of 1.5 to maintain minimum solvency ratio. Insurance companies whose ratios are dangerously close to minimum level are closely watched by IRDA. 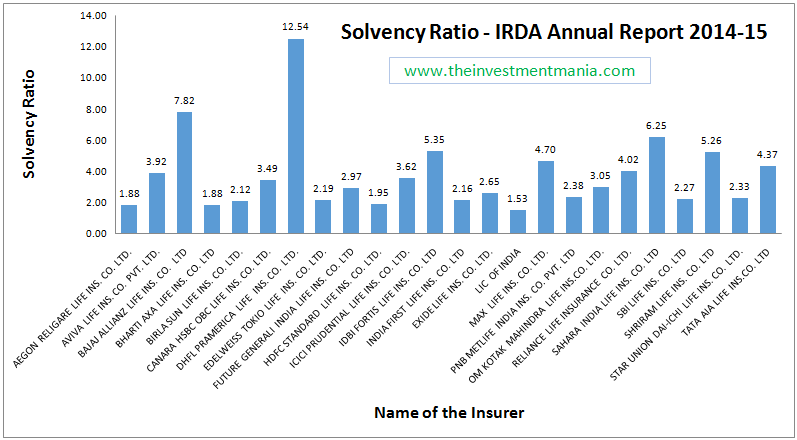 See below values for solvency ratio of various insurance companies per IRDA Annual Report 2014-15. Per latest IRDA report 2014-15, all the 24 insurance companies meet minimum solvency ratio requirement with DHFL PRAMERICA LIFE INS. CO. LTD. topping the list with 12.54 & LIC is lowest at 1.53, which is slightly above 1.5, this is because LIC is operating in India from 1956. So a lower Solvency ratio may not always indicate a weaker company. One needs to study all points in conjunction with this point. There is no doubt that a Higher the solvency ratio the better for the policyholder, as it gives them a sense of comfort that the liabilities are backed by assets more than the mandatory limit set by IRDA. However, a high ratio is not just enough. But it could also be the case that in the short run, a particular company has garnered additional investment assets or accumulated profits which have still not been put to use. And as the number of policyholders increases, this will change. So you need to check for good financial background, reputation, longevity and trust factor. Every company in Insurance industry takes 7-10 years before turning profitable. So better to be associated with insurers who have deep pockets, trust, making profits consistently and had been around a while. For eg., LIC, HDFC, ICICI, Kotak are well-known brands with deep financial roots. LIC is the most trusted brand in India not just in insurance. LIC is the most trusted company in India for from many years in a row across all industries. By and large, the higher the solvency ratio, the stronger the company. Now we have to list down all these seven companies’ premium rates to arrive at cheapest and affordable. Here is the list of premium calculated. From above chart, you can notice that LIC is the costliest one among all other companies. 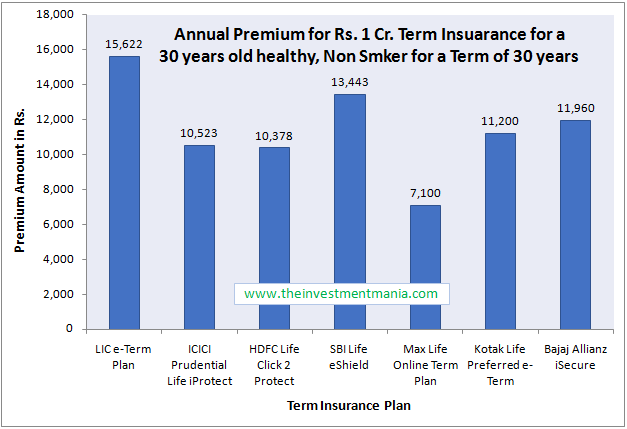 At the same time, Max life Online Term Plan is offering the lowest premium. Do remember that the above premiums may change based on your health condition or some other factors. Typical pure insurance term plans & not any riders, benefit payout options or so. I have listed only the companies which have high claim settlement ratio. The term selected is 30 years. However, I would suggest you consider the term of insurance up to your working life. Life Insurance may not be required during/after retirement. In recent years there have been many fraud companies, which used money from insurers & ran away with money in the very short span of time. So it is necessary to choose the insurance company which has long existence. There is no any hard rule but an average of 10-12 years gives us good confidence that the company is good. LIC is in existence from last 60 years, so this definitely leads the chart followed by HDFC life, ICICI Prudential, Birla Sunlife, and Bajaj Allianz with more than 15 years in the industry. I agree that we can’t predict the future. However, at the same time, we must have to look at history to predict the future. Even though some new insurance companies may be offering “Cheap Online Term Insurance Plans,” but for the sake of safety, try to stick to old companies. Now let us go ahead & see some of the plan features like the minimum term, maximum term, Entry age & coverage. Also, we will go through premium payment terms. Here I have listed top companies which were amongst the top companies which have good claim settlement ratio & which offers best features. Most of the companies do offer policy coverage from 30 to 40 years. Let’s say your age is 25 years & you need to cover up to your retirement i.e. 60, then you have to choose an insurer which provides a policy cover of 35 years or more (In this example you can see except SBI life & Bajaj Allianz, all companies offer 35-40 years cover). Here the factor you have to look for is policy term that you want. Premium Payment Mode – Here you have a lot of options like monthly, quarterly, half-yearly or annually. However this should not be the selection criteria, but I just wanted to let you know that if you miss a premium date in some emergency situation, then you can lose your policy. So I would suggest going for Annual/Yearly payment mode. Here you will get more grace period to pay your premium. All other factors are pretty much all covered in all insurers companies like max. Sum assured has no limits (except Max life which provide max. Rs.100Cr. cover). If required, buy accidental insurance separately from general insurance companies, which are cheaper & will give you more cover. The process of filling online application should be easy. The front end should be simple so as everyone should understand what they are submitting. Few insurance companies do have very simple steps for filing application such as ICICI, HDFC & SBI. Finally, you should review the quality of the service provided by the insurance company. The assistance they provide while applying online & after the policy. You should also review their past records. Before buying any type of insurance plan, look at the insurance company’s Claim Settlement Ratio. But note that Claim settlement ratio is just one of the factors and not the only factor when buying a Life Insurance Policy. Do not hide any facts while filling the proposal form. This will ensure that your claim (in case any unfortunate event happens) will be settled quickly. Most companies cite incomplete documentation or concealment of facts as a reason for rejecting claims. Hence, while buying a life insurance, it is of utmost importance that you furnish accurate information and ensure that all paperwork is in place. Give importance to claim settlements record and do not get swayed away by lower premiums/tax benefits alone. As per the recent amendment to Section 45 of the Insurance Act, If your policy is 3 yrs old, no matter what happens, the life insurance company won’t be able to deny the claims. So, your life insurance company has only 3 years in hand to reject the policy based on any misrepresentation or misstatement. So once 3 policy years are completed then the insurance company HAS to settle the claims and cannot reject them. Factors mentioned above are critical while choosing the best term plan. As noted above note that Claim Settlement Ratio is more than 90%, Solvency Ratio is well above 1.5, Premiums are lower, Existence of the company is an average of 10 years or above & which offers more flexibility. Note that all above factors are paramount, so consider each point in conjunction with other points. Thanks Sameer. Please subscribe to our blog for getting all future posts in your email.